After years of waiting, the Social Investment Fund, a statutory body of the Ministry of Economic Development, has finally secured and approved funding for an adequate water system for Crooked Tree Village. Funding for this project will cost approximately BZ$1,449,545.00. Of this sum, $903,000.00 came in the form of a grant to the Government of Belize (GOB) from the European Union. $397,241.00 represents GOB counterpart funding and BZ$149,304.00 by the Crooked Tree Community and the Crooked Tree Village Council in the form of trenching for pipe installations. The scope of the work includes: construction of a 20,000 gallon elevated concrete tank with a 10 feet by 10 feet pump house complete with fencing, installation of 66,000 feet of transmission and distribution lines, 7,350 feet of piping for house to house service connections, installation of a submersible pump with chlorinator unit, training in management of the system, and administrative expenses incurred by Social Investment Fund staff and equipment during project implementation. A launch ceremony was held at the project site on October 8, 2008 at 10: a.m. Guest speakers at the event were the Honorable Erwin Contreras (Minister of Economic Development, Commerce, Industry and Consumer Protection); Honorable Edmond Castro (Minister of State in the Ministry of Works and Belize Rural North Area Representative); Dr. Marcelino Avila (Project Director of the Belize Rural Development Program); Ms. Yvonne Hyde (Chief Executive Officer in the Ministry of Economic Development, Commerce, Industry and Consumer Protection and National Authorizing Officer to the European Union); and Mr. Ian McMillan (Executive Director of the Social Investment Fund). The project was scheduled to be completed by April of 2009. However, the date has been pushed back due to the October flooding. As of now, work will begin only in January of 2009. 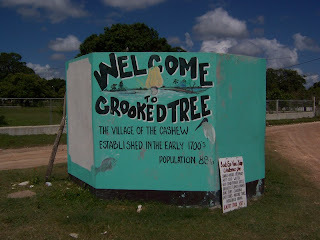 Crooked Tree Village, in the Belize District, consists of approximately 800 residents in 245 households that will benefit from the water project. In the village's period of drought, often occurring seasonally, many of the wells in the Village dry up and residents suffer greatly from a lack of water. It's not unusual to see water trucks bringing water to the residents daily. Linda, this is very good news, indeed! Our people in Crooked Tree are very well deserving of this vital element of a modernized society. I am hopeful and fully trusting that this project will be successfully implemented as planned. Thanks for making this information available.